tomorrow we are hosting our first (annual?) kentucky derby party. i have been working like crazy this week to get the house in order, menu planned and food prepped. i will be back next week with photos from the festivities, but in the meantime, i'd like to share the party invitations. i printed the invitation cards on white cardstock. 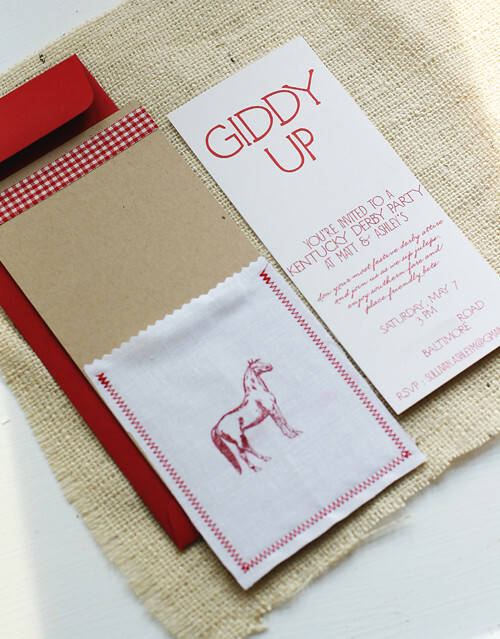 there was plenty of heavy kraft cardstock leftover from the wedding, so i used a piece of that as a backer, sewed a muslin pocket on with a red zig zag stitch, and inserted the cards*. 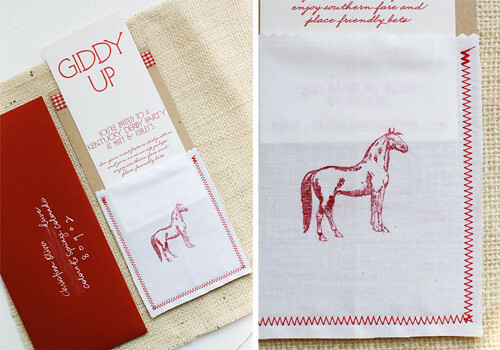 a red horse stamp and strip of gingham fabric tape finished them off. see you on the flip side.. i've got a big hat to wear and juleps to prep!